Are you planning to run in the next elections? Or are you part of a campaign team gearing for a national or local campaign? Much has changed since the last presidential elections, and even the more recent 2013 polls. This seminar will provide you practical information – from campaign costs to campaign strategies – from experts in the political and communications field. 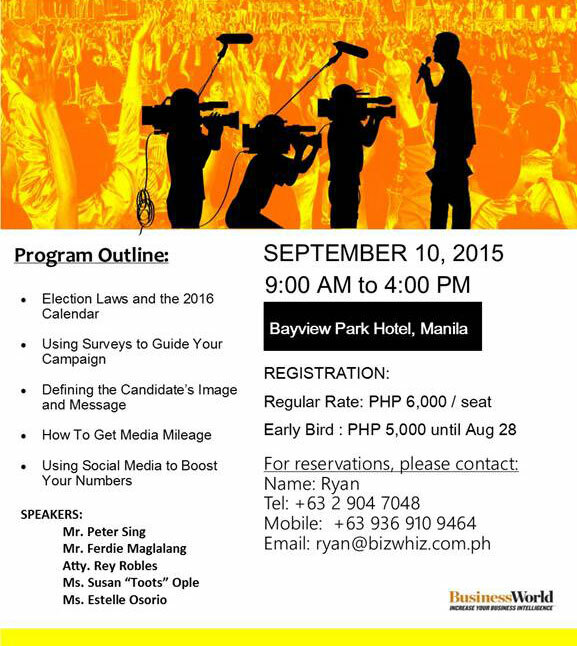 Biz Whiz would like to invite you to a 1-day workshop that aims to equip you with tools of the trade in setting up a winning campaign this election. Determining the Election Calendar is critical in setting up your campaign operations. In this segment, you will learn specific details about the official Comelec Election Calendar. Know the Do’s and Dont’s during certain periods. Avoid legal pitfalls before and during the campaign period that may lead to legal challenges after the results are known. Atty. 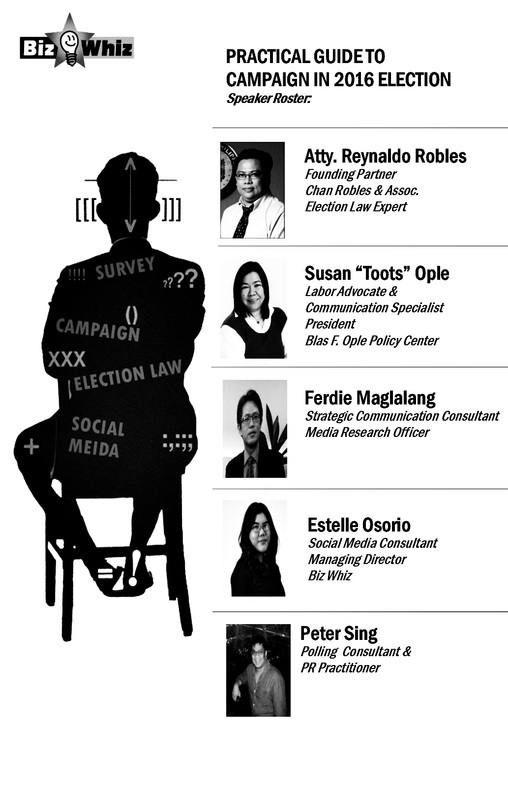 Reynaldo Robles of ChanRobles & Associates is well-versed in Election Law and can provide expert advice on legal requirements for both national and local candidates. His law firm’s website: www.chanrobles.com is replete with information on election jurisprudence as well as other legal matters. Polling is a tool that measures voter intentions for a particular period. This segment will teach you all about the ins and outs of political surveys including when and how to use its results to boost your chances. Also included in this session, a thorough discussion about Focus Group Discussions (FGDs) in determining the effectiveness of your campaign slogan, color, campaign jingle and other collaterals. The goal is to determine voters’ perception through polling and use this knowledge to tweak, alter, or strengthen the campaign plan in order to win votes. Mr. Peter Sing is a highly respected PR practitioner and an expert at understanding surveys and FGDs. He has handled several political campaigns in the past, and was formerly the head of the Senate’s Public Information and Media Relations Office. Every candidate should have a clear, defining message and an authentic, credible brand. Message consistency enhances a candidate’s image while improving name recall among voters. In this session, you will learn how to unclutter a candidate’s mind, zero in on the right image, and create a message framework that can easily be cascaded to grassroots supporters and political allies. Ms Ople is a well-known OFW advocate with two radio shows, a weekly column in Arab News, and extensive experience in media relations and strategic communications. As a former senatorial candidate and daughter of the late Senate President and Foreign Affairs Secretary Blas F. Ople, Susan is quite familiar and at ease with the political and media terrains. Spreading awareness about the candidate is critical in any campaign. In this session, you will learn how to draw media attention and build extensive connections with members of media. It all begins with finding the right issue, and making a strong stand for or against it. Media relations is critical in any political campaign, and with social media, it is not unheard of for a popular candidate to suddenly drop to the bottom due to a PR crisis engineered by a political rival. Ferdie Maglalang, a former senior reporter of the Manila Bulletin, previously headed the Malacanang Press Corps. He teaches Journalism at UST and writes a weekly column for Remate. Digital Campaign will play a very important role in this coming election. In this session, you will learn how to increase your subscriber base using social media platform, increase their engagement, and influence them in voting for the candidate. During this session, the participants will have a chance to sit down with the experts to talk about actual application of the lecture to the candidate’s situation. Bayview Park Hotel is located along Roxas Blvd, Manila. It is in front of the US Embassy Manila. Parking is available in front of the hotel. Valet service is also available. You may register on-site at the regular rate, provided there are still slots.